You are here: Home - Editorials - Timetrade "State of Retail 2015 Report"
In today’s connected society where consumers are used to service anytime, anywhere, the bar has been set very high for customer experience and the retail industry is no exception. Retailers are realizing they must provide a superior customer experience in order to survive. TimeTrade recently conducted a survey of 1,029 consumers, which asked in-depth questions regarding their perceptions and behaviors around retail shopping. What the survey reveals is that the physical retail store is still relevant because more than ever, customers are looking to the in-store experience to help them validate their final purchasing decisions. Retailers must be aware of this shopping behavior and make sure their in-store associates are equipped with the right knowledge to help customers. Additionally, not only should store associates be knowledgeable, but also readily available, which means improved management of the store flow and balancing pre-scheduled appointments as well as walk-ins. Recent research by eMarketer also reveals that disposable income spent by consumers in the U.S. for brick-and-mortar retail stores will grow to be $5 trillion by 2020, all the more reason for retailers to focus on enhancing their in-store experience. Retailers must also keep in mind that when consumers are searching online, this is the opportunity to convert the digital first contact to a more valuable level of engagement, such as an in-store visit. This creates a high-value, personalized interaction that leads to a more satisfying experience for the customer as well as creates an opportunity for cross-sell/up-sell for the retailer. Retailers can also use survey and analytic tools to track the customer’s experience (from inquiry to purchase) and learn how to improve processes in the future. The store associate or manager can use this information to follow up with the consumer for future needs. All these elements create an optimal path to purchase, which TimeTrade sees as most crucial to retailers in terms of creating brand loyalty. The TimeTrade survey also reveals that various demographics have different shopping habits. For example, Millennials have different shopping habits than Baby Boomers or Gen Xers. In addition to demographics, the survey reveals habits around mobile shopping as results reveal that consumers are using their mobile device for browsing more than actual purchase. This report examines the current state of retail, what changes are occurring in terms of consumer habits and what actions retailers need to take in order to retain their customers. This report gives an overview of TimeTrade survey data as well as research from other sources and industry outlook and opinions from retail and customer experience analysts on the current state of retail as well as predictions of what will happen in retail over the next few years. Today’s connected consumers have set the bar very high for customer service and retailers know they must accommodate these expectations through superior service, or they will lose market share. Retailers are realizing more and more that the key to superior customer service is personalization. This means knowing the customer and being able to anticipate their wants and needs, and in the case of retail, being able to anticipate their purchase behaviors and give them the appropriate help. Companies have been using analytic tools to gather information online, through digital and social channels, as well as call center data, to get to know and build a closer relationship with their customers. However, retailers also realize that a highly personalized in-store experience with a knowledgeable associate is what leads a lasting impression and creates brand loyalty. This is where we see a paradigm shift in retail. Though e-tail channels are still popular, we are seeing retailers placing a renewed value on the physical, in-store experience. Even traditional e-tailers such as Amazon are opening up brick-and-mortar stores in hopes of providing a more personalized experience. And, congruently, consumers are admitting that in terms of their shopping habits, they prefer the in-store experience so they can feel and touch items and most importantly, make final purchase decisions. This changes the dynamic of the in-store experience, as retailers must keep in mind that consumers are now much more educated and want knowledgeable help. C-level retail executives, store managers and associates must be prepared for this new type of customer while understanding that different demographics will have different spending habits and needs. This report further examines the drivers behind changing consumer purchase behaviors today, what this means for retailers and what changes need to be made in order to keep them relevant. > Retail stores are still relevant: 87% of respondents to the TimeTrade survey plan to shop in stores at least as often as they did in 2014. > Consumers prefer to shop in-store: More than half (65%) of survey respondents report that if an item they want is available online or in a nearby store, they prefer to shop in the store. > Drivers for shopping in-store: An overwhelming majority of consumers (85%) report they like to shop in the store because they like to ‘touch and feel’ products before they decide what they want to buy. > Once consumers are in the store, they are willing to spend: Nearly 60% of consumers prefer to shop in store when spending as little as $50 and as much as $200. And, 82% of all consumers surveyed will buy more than they originally planned to. > Mobile Shopping is slow to grow: More than 42% of consumers have never purchased something on their mobile devices and when consumers are looking to buy something, only 13% will make a purchase from their mobile device. > Though mobile and online shopping trends frequent headlines, mobile shopping is not predominant: Most consumers use their mobile device only to browse for items (50% to research products, more than 60% to compare prices, and 46% to look for the nearest store location). > Millennials can be a gold mine for retailers who get it right: More than 90% of 18-34 year olds plan to shop in stores as often if not more in 2015 as they did in 2014 and 92% will walk into a store either know exactly what they want or having narrowed it down to 2-3 products and 87% will buy more than they intended to when shopping in a store. > Millennials look to meet in person: 25-34 year olds are more likely than any other age group to book online appointments. > Baby boomers are spending as well: Baby Boomers are still the group controlling 70% of the disposable income in the United States. > Consumers want knowledgeable help: Nearly 90% of survey respondents are more likely to buy when helped by a knowledgeable associate. > Consumers today do much research online prior to going into the store and approach the in-store experience as the final buying decision: Nearly 90% of consumers are more likely to buy when helped by a knowledgeable associate. > Consumers seek associates with expertise: 50% of respondents report what they value most in a sales associate while shopping is smart recommendations. > Consumers shop based on superior customer experience: 63% of respondents report that if an item is the exact same price at four different retailers, they will decide where to shop based on the overall customer experience they have in the store. What does this mean for retailers? There is no doubt that all generations of consumers are more educated and more selective than ever. Consumers are using digital channels for research, but still looking to the in-store experience to help with final purchasing decisions. More than ever, retailers need to have a seamless flow between channels and, once the customer is in the store, provide a superior in-store experience. In order to standout, retailers must make sure they are providing customers with the right knowledge while keeping in mind that the majority of TimeTrade survey respondents prefer shopping in stores so they can touch and feel things. Retailers can enhance the in-store experience through prompt service and enable a smart hands-on experience that helps customers with their final purchasing decisions. “Forrester believes that, in the future, retail stores that drive convenience, service, and relevant personalized experiences through the use of digital store technology will succeed. Why? Because today, customers show an affinity for digital store technology. In fact, 66% of luxury apparel customers are more likely to shop with a digitally-enabled associate. Those retailers who wait on the side-lines are at risk of maintaining the status quo and may only grow marginally. Richard Reynolds, Director of Retail Operations for C Spire, a regional U.S. telco, notes the changes they are making to their retail stores in 2015. Meaning the in-store experience is what will drive your store or brand’s online or social perception, making it more critical than ever. This comment validates that the notion of retail convergence, the converging of web and physical retailing is very real and important. Beacons. Sensors placed around stores that communicate information to smartphones - will track information such as which products customers linger around. The beacons can then push information on those products to customers’ mobile devices, allowing them to order from their devices and have merchandise shipped to their homes. More Intelligent Devices. Stores will use devices that can determine the demographic information of customers as they walk by, and target ads to them through a video console, similar to smart shelves being developed by Mondelēz International. Store Associates Can Focus On Customers. Retailers will be able to take advantage of managed infrastructure at the edge. This is a vitally important enabler because having to add relatively expensive IT staff can make deploying new technologies in retail environments cost prohibitive. Of course, sales associates will not disappear. Rather, with many of their routine tasks automated, they will be able to focus more on building relationships with customers while increasing sales and affinity for their employers. Analytics. Brick-and-mortar stores will use analytics to map where people walk and what the pickup so they can better position products in the store or track shoppers at the device level to target promotions to them. This data will be used to understand customers and increase sales. Technology as a Sales Assistant. Technology will increasingly automate a lot of routine and mundane processes that happen in retail stores. Whether it is more self-service check-outs, in-store mapping to make it easier for customers to self-navigate around stores, or beacon and NFC technology for greater self-education on products, technology will play a greater role in automating the retail experience. The following experts are from Research’s Spotlight report The New Digital Divide Blurs Lines Between Digital and In-Store written by Sheryl Kingstone, Director of Research. The TimeTrade survey has revealed that various demographics have different shopping habits. Millennials are looking for products and service that is very focused on the individual, while Baby Boomers and Gen Xers have done much research and want purchase validation from an honest and transparent retailer. Though all have different shopping habits, what they all have in common is disposable income as retail sales continue to grow. 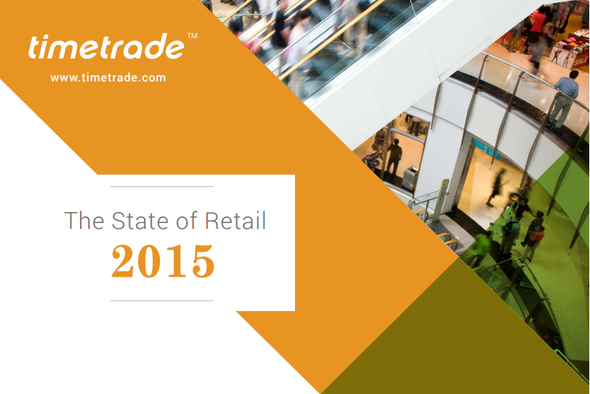 The full State of Retail Report 2015 can be accessed here.